142. 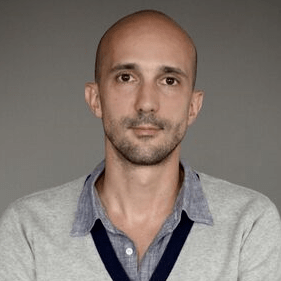 Joseph Donyo of Canım Istanbul on Newsletters & The First 10,000 Subscribers – How to Shape Human Behavior. Out of curiosity one day, I started researching the digital media lifestyle market for women in Istanbul and found it was not a very crowded space. When I asked my female friends what online women’s magazine(s) they relied on, I was surprised to find they could not name a single website or blog. When further research found that there were in fact no strong players in the market and no equivalent to what I envisioned, I leaped at the opportunity. 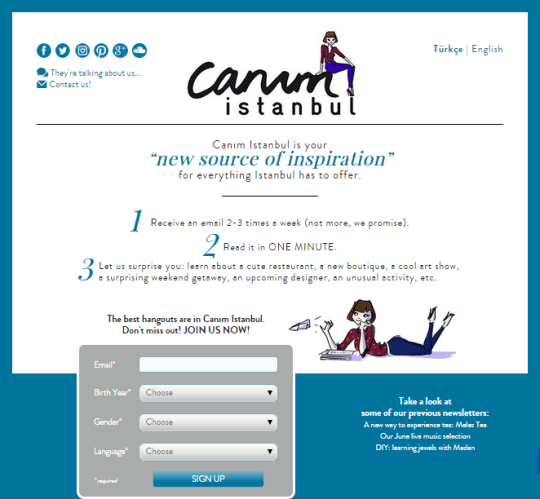 Canım Istanbul went live in August 2014, and our first newsletter was sent out a month later. Just recently we celebrated our 1 year anniversary, which also coincided with our 10,000th newsletter subscriber and our brand new website launch. How did you identify your target audience? Canım Istanbul was launched with a mostly women audience in mind, but I didn’t want to openly position it as such to not exclude men from it. So we gave it a feminine twist with the tone of the writing, the illustrations and the general design. Today, Canım’s principle newsletter subscribers are Turkish and English-speaking women between the ages of 25 and 44 years old with a college-degree or higher. 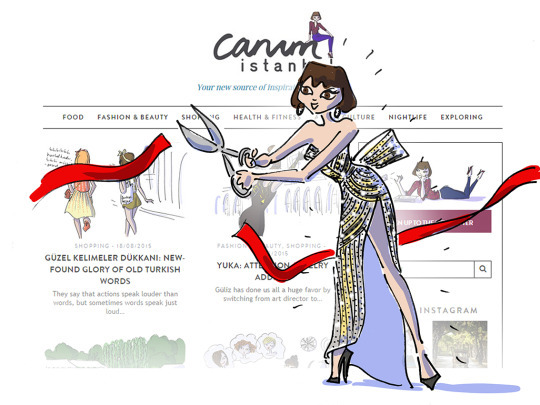 But with the launch of the Canım Istanbul website, it will be interesting to see how our readers evolve. Why did you choose to start with a private email-only newsletter and not a full-on website? Personally, I have always been a heavy reader of newsletters; I love this medium. I just prefer the content coming to me rather than me having to go out and fish for it. 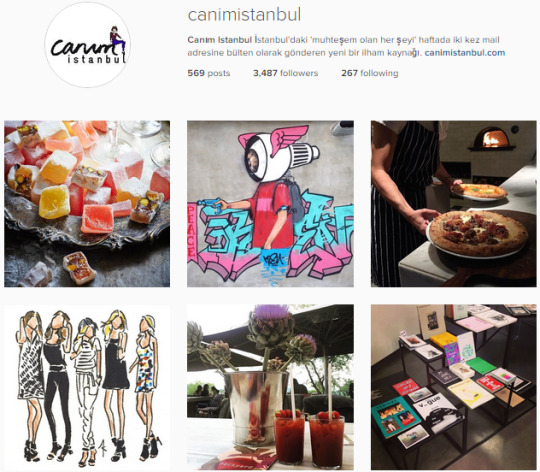 Having said that, my initial plan was to launch Canım Istanbul both as a newsletter and a website. But after several planning setbacks which risked pushing Canım Istanbul’s launch date further and further back. I decided not to postpone the launch but to start Canım Istanbul as a newsletter-only platform with a simple landing page inscription, knowing I could always launch the website version when I was better prepared. After 4 months, the newsletter took off so quickly that I preferred to stay focused on the landing page and newsletter rather than speading myself thin on a website. The signup landing page has converted at an average rate of 17% since it’s launch (with peaks of 30-40% on certain segments). What mistakes did you make that you would warn other entrepreneurs of? The only one I can think of would be to start with a mobile-first approach. I didn’t really account for this at the beginning, and after a few months I realized that over 50% of Canım’s newsletters were being opened on a mobile device. What are a few of your favorite ads? Consistently making the editorial content of the newsletter as relevant and high-quality as possible. Relentlessly reaching out to new people who would be interested in what Canım Istanbul had to offer. The editorial part involves constantly exploring Istanbul’s new and up-and-coming places and brainstorming with the editors. You know you’ve gotten your content and target audience mix right when each newsletter email’s open rates are high and unsubscribe rate is very low. The marketing part is more challenging and diverse, a typical challenge for every new venture. By far, our main source of subscribers for this year has been through Facebook. The first wave of people to sign up to the newsletter was my close friends, followed by my extended network (friends-of-friends). Every new article was shared on our FB page so people who had liked our page but had not signed up to the newsletter could see the kind of stuff we talked about. I painstakingly posted every newsletter into every relevant group I could find, and with each newsletter publication the place/person/event we’d written about usually shared our newsletter with their loyal followers. This organic social media groundwork led to a lot of word of mouth as well as our first press coverage in the Turkish media. Within four months we had our first 1,000 subscribers, and since then we’ve enjoyed a steady stream of press coverage, including Hürriyet Daily News, Turkey’s largest English-language newspaper. I also printed postcards which I put at cafes and stores, as well as little stickers that I gave to friends and asked them to stick them anywhere they went around town. The real success came when I started experimenting with Facebook ads, which I discovered had amazing targeting capabilities. Needless to say, when you get your message in front of the right people, there’s a higher chance they’ll come to your site and when they do, the sign-up rate will be much higher than when people randomly find you. So I started running ads more frequently and trying out different audiences as well as more advanced Facebook features, and that’s worked very well. Partnerships are good, too. Last December I partnered with French Oje, a beauty blogger for a one-off holiday beauty tips newsletter. I’ve also partnered with Cizenbayan, a well-known Turkish blogger for a monthly “live music picks” newletter edition available on the CanımIstanbul Soundcloud. As her music tastes are very eclectic, this collaboration has had the benefit of both producing good content and reaching out to new people. [EDITOR’S NOTE: For more information on how the online advertising industry works, check out the documentary Generation LIke by Douglas Rushkoff. We are also very active on Instagram. Instagram is huge in Turkey but it’s really its own medium, so we give it its own content and don’t actually promote the newsleter very much. It doesn’t drive many sign-ups for now but it gets our name out there. Plus it’s growing steadily and it’s fun to play with. Posted on October 3, 2015 by Joshua SMITHPosted in interviewTagged canimistanbul, interviews, istanbul, joseph donyo, men, owners, turkey.